Description: An Extinction variant with AI Bots - Covenant Elite (Red) vs. Marines (Blue). Several improvements have been made to the map, including mods to scenery, vehicles, portal locale, etc. Some scenery, weapons and vehicle tags had to be removed to make room for AI. The ctf flags have now been moved into the each base, which are now heavily guarded. Most portals and groups of vehicles are guarded by AI. 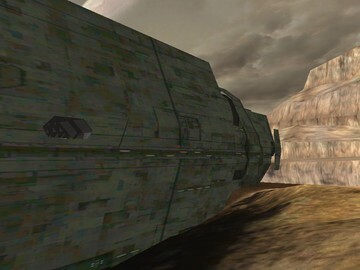 Marines man turret guns at the entrance to their base, and Elite man turrets at each sniper nest on the mountain cliff. Two Seraphs have Elite pilots, and will try to hunt you down as well as some of your Marine comrads. Two new covenant gun towers have been placed on the right side, and one of the towers at the left and one at the right are manned by elite. New teleportals have been added at many different locations such as on both the front bridges, and at gun tower platforms to get back down. There is also a new portal at the bottom of that strange "pit" located in the second covenant base. 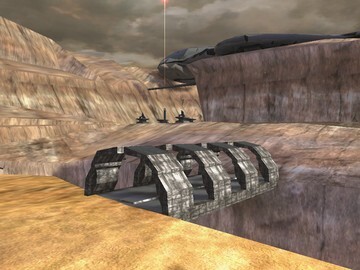 This is fun for solo play, but other players can join the battle and change to blue team for a joint effort to help the Marines battle the Covenant, or vice versa. The night switch biped is there, but if killed, the AI will appear frozen. If your PC specs aren't too good, then it will probably clip and lag, but it may help if you tweak the graphics down. The map works on a 10 year old Gateway Pentium 4 with an 128 MB Nvidia graphics card if some graphic features are sacrificed, but really smokes on our Dell 530s with Intel Dual-Core and a 256 MB ATI Radeon.